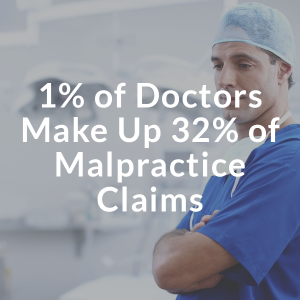 1% of Doctors = 32% of Malpractice Claims | The Law Offices of Flint & Soyars, P.C. Some unsettling news was released by The New England Journal of Medicine. A recent study found that a mere 1% of doctors account for 32% of all medical malpractice claims. The legal and medical community were both surprised by this disproportional distribution of claims. 84% of doctors who paid claims only paid one claim during the years studied. This portion made up about 68% of the total claims paid. The remaining 4% paid a minimum of three claims, 12% of all claims. This study shows some good news and some terribly frightening news. The good news is that you have a really good chance of getting a doctor who wouldn’t be considered claim-prone. The scary news is that if you do get a claim-prone doctor, the likelihood of having to file a medical malpractice claim is high. The lesson is incredibly clear, avoid doctors with multiple claims. While this hopefully isn’t a new concept, it’s very important. Doing your homework on a doctor isn’t very hard, checking local court records will show if any legal action has been taken against a doctor or you can use DocInfo to see if any disciplinary action has ever been enforced. Healthgrades will show other helpful information like patient satisfaction.